As a therapist, I am in the business of change. Generally speaking, people come to counseling because they want something to be different in their lives. As a social worker, I’m also challenged to consider what it means for particular groups, communities, and systems to change. Much of my mental capacity is spent considering the process of change. Over the past several years I have become increasingly interested in the change process for individuals with some form of privilege, particularly white privilege and male privilege. How does a white person become aware of their privilege? What does it look like for a man to confront his male privilege? How does someone move from being unaware of their privilege (which is where most people generally start in regard to the privileges they hold) to becoming aware to doing something about it? There are all types of opinions and approaches to this question – how it happens, what is involved, who is responsible, how not to do it, etc. There does appear to be at least one component that is essential: LISTENING. Listening is key. Regardless of the specific steps, listening must be part of the process. Listening in a way that involves your mind and your emotions. Listening when it feels weird or uncomfortable or foreign. Listening when you want to resist and yell and cover your ears and justify yourself and ease your discomfort. Listening in a way that absorbs rather than simply preparing to respond. This listening process could and should involve a variety of specific actions. It should PRIMARILY include listening to the oppressed group(s). There can be value to listening to others who share your privilege but have perhaps taken more steps toward change than you have, but if your listening does not lead you to the voices of marginalized groups, you’re doing it wrong. Period. You are still sitting quite comfortably in your privilege. Listening means seeing the humanity in people whose experiences are different from your own. Watching films & documentaries on oppression, systemic injustices, the history lessons you never heard in school, etc. Thoughtful listening to women and/or people of color in your circle – your friends, co-workers, clients, patients, customers, etc. Listening means you are not trolling (whether in real life or online). Listening means that you really want to hear what the other person has to say, even if you don’t get it. Even when it doesn’t feel good. Even when you’ve been conditioned to question what “they” are telling you. Part of any type of privilege is being socialized to think that whatever privileged group you are part of it is normative and preferable (even though this is may not be explicitly stated). This is part of what makes many of us resistant to facing our privilege – because it requires changing so much of how we have viewed ourselves and the world. Listening means realizing that we cannot simply lump together “all black people” or “all women” – it means seeking out a variety of voices from within those communities. Let me share some personal examples of what listening has looked like for me in terms of my white privilege. Listening has involved tuning into the stories shared with me by therapy clients of color about their experiences with the system (including the legal system, the child welfare system, the mental health system). Realizing that their experiences were so different from my own and from how I was raised to view the system (e.g. as inherently good and functional). This listening occurred in informal conversations, in observations of some of those interactions, in supervision, and in my reading. Listening meant believing my clients and learning how to create a safe space in the therapy room for them to process those experiences if they choose to do so. Listening has involved a LOT of reading – recognizing that almost all of the books (of any kind) I used to read were written by white people (and often by men). Asking myself hard questions about why that is. Making intentional choices in the books I now seek out. This year I’ve chosen to only read female authors, primarily women of color. Listening has meant following an incredible variety of voices on twitter. I really began to do so following the murder of Mike Brown in Ferguson, MO. This listening, in turn, made me aware of some sources I may not want to listen to less…like much of the mainstream media. Listening has meant showing up to community events and seminars that are open to me as a white person but not designed for me and not centered on white people. It means showing up and being one of the few white people in the room (something most of us white people just don’t experience often). It means showing up and shutting up – adopting a learning stance and not inserting myself into the group discussion to try and assuage my white guilt in some way (there is almost always a fellow white person in the room doing this…don’t be that white person…). Listening also means listening to myself. Being honest and aware of my struggles addressing my privilege, of my white guilt, of my discomfort when I enter spaces in which my whiteness stands out, of my implicit and explicit biases, of my fear, of my avoidance. Each person’s listening journey has a unique starting point. If pursued, additional forms of listening will be added. It may start with a particularly impactful film followed by reading followed by a conversation with a co-worker. Perhaps it starts with hearing the story of a peer or neighbor followed by attending a rally followed by diversifying your sources of information on social media. Maybe it starts with an especially troubling news story followed by the responses of some of your clients followed by attending a community event. Whatever it is for you, lean in and listen. Listen more deeply to those who do not share your privilege. Listen to voices of the past and the present. It is the only way we will be able to engage in creating any type of sustainable change, in dismantling oppressive structures and systems, in resisting paternalistic answers that do more harm than good. My dear white sisters, this first post is dedicated to you. To us. I started writing it in my head a week ago after attending my local sister march of the larger Women’s March on Washington. I didn’t fully decide until late in the week whether I even wanted to attend. As an introvert whose job is to walk alongside victims of domestic violence experiencing immense trauma & safety concerns, a large social gathering is not exactly my idea of self-care. I also had a lot of questions and concerns about whether the space would truly be intersectional or would by-and-large be more of a white feminist space. My experience was mixed. On the one hand, I had a visceral emotional response to standing and marching with thousands of sisters gathered together in that space. I felt visible as a woman, something that is not a given in my day-to-day experiences as a woman. And there is something communal about such an experience, despite knowing that I likely disagreed with other marchers on MANY issues. One of those overarching issues being the need for intersectionality. 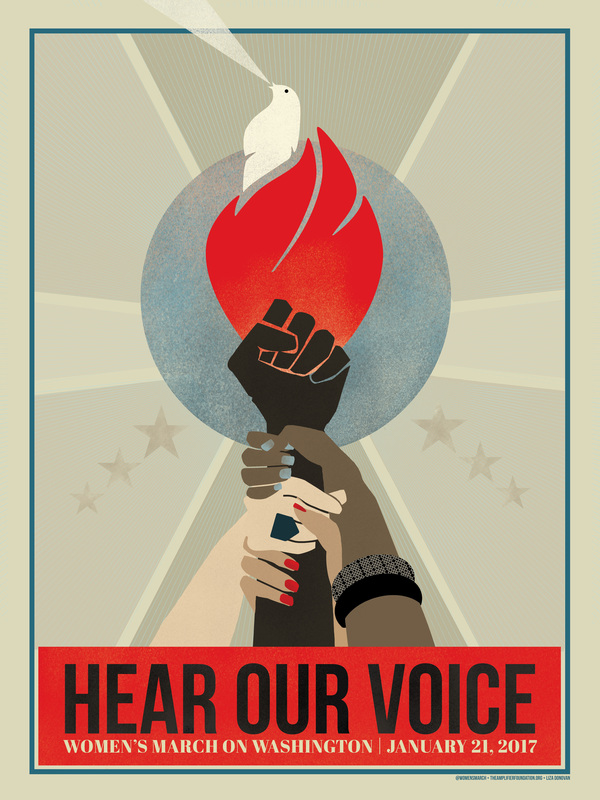 While efforts to make the Women’s March and sister marches intersectional were certainly apparent, there is a lot of work to be done to continue moving in that direction. This became especially clear in the hours and days following the march as white women pushed back on critiques expressed by women of color. White sisters, it is beyond time for us to start listening to and following the leadership of our non-white sisters. To hear, reflect on, be challenged by, and feel uncomfortable about their critiques and frustrations and pain and anger. NONE of this minimizes our experiences of gender-based oppression. But as white women, we stand with one foot in oppression (as women) and one foot in privilege (as white women). I invite us to use our own experiences of gender-based oppression to cultivate a deep empathy for those who are oppressed due to the color of their skin (and every other type of oppression we may not experience due to our respective privilege). We HAVE to stop dismissing and talking over and minimizing and ignoring the very real experiences of our sisters of color. And we have to reckon with our collective participation (as white women) in their oppression – both historically and recently (regardless of how you voted individually, we collectively supported Trump…who has already followed through on an overwhelming number of horribly oppressive and unjust campaign promises…that will collectively have a greater negative impact on our sisters of color than on us). And for the love, stop expecting a cookie and a pat on the back from our sisters of color when we do show up or speak up. They don’t owe us sh*t. This doesn’t mean stop showing up. But it does mean to start listening and learning and following. It means holding each other (as white women) accountable. It means standing up to injustice even when it does not directly impact us. It means taking risks and getting out of our comfort zones. I don’t know where you are starting from today, but please don’t stay there. Please act. Please figure out what you need to do next. I will try to share some ideas soon and I am sure there are plenty of other posts and articles currently circulating on the topic. We are stronger together, but only when we make sure the voices of those most marginalized are the ones that are given the most attention and care (if you consider yourself a Christian, this is definitely modeled by Jesus). This means it’s time for us white women to stop re-centering the conversation on ourselves and to move to the outer rings of the circle and to adopt a posture of listening. Only then can our collective voices be heard. So let’s get to it.